OAKVILLE, ON--(Marketwired - May 09, 2017) - The 3D design and 3D printing specialists at Canada's Javelin Technologies are celebrating 20 years in business with gifts of SOLIDWORKS® computer-aided design (CAD) software and training services to the Canadian start-up community and to high school educators and students. Javelin is a reseller for SOLIDWORKS software and the full range of Stratasys 3D printers, and is a leading training provider. The company had its beginnings in Oakville, Ontario in 1997 with a partnership between John Carlan and Ted Lee -- a classic Canadian start-up story of its own that began over coffee meetings at a Tim Horton's. The two continue to steer the ship today as co-managing directors. "When we started the company, I never thought that someday we would have almost 100 employees and offices all across Canada," said Carlan. "Ted and I are very proud when we think about our employees and their families and how they've prospered, and to know that we've provided 3D design software and 3D printers to more than 4,000 Canadian companies. I never imagined we would ever be talking about supporting 'thousands' of customers." To recognize the milestone year, and with the support of SOLIDWORKS, Javelin will donate software licenses and provide support to software user groups, as well as entrepreneurs and designers working in supported community spaces such as incubators, accelerators, and maker spaces, where new business people and creative types get access to tools and services to help them turn ideas into business ventures and products. Javelin will also donate to high schools across Canada. Each school's package, for example, will include licenses of SOLIDWORKS Student Edition 3D design and analysis software; access to "My SOLIDWORKS" online portal for resources and support; Javelin's live, online, instructor-led training in SOLIDWORKS Essentials for one teacher and two students; and a visit from a Javelin applications engineer. In recent years, Javelin has focused heavily on its customers in education. At one time that focus was almost entirely on post-secondary classrooms. Today, more and more teachers and students at the high school level consider access to SOLIDWORKS and 3D printing to be essential in preparing students for further education and the workforce. Lee says he is proud of the impact Javelin has had on helping young people become professional designers and engineers. "Every year, many thousands of students use SOLIDWORKS and Stratasys 3D printers in their schools. They are then finding employment with excellent Canadian companies, inventing products for markets all over the world -- products that improve safety in manufacturing, advance medicine, purify our water... truly important and impressive work." In 2016, Canadian Business and PROFIT named Javelin as one of the Fastest-Growing Information Technology Companies on the PROFIT 500 list, which ranks Canadian businesses by their five-year revenue growth. An early commitment to developing expertise in 3D printing and continually offering new products to the most creative of designers has kept Javelin thriving. The Javelin website is a source of technical information for designers all over the world and the training team has expanded training offerings, with new courses and new delivery methods. "When I think about our industry, I am proud to know that over the past 20 years no company in Canada has done more to improve the productivity of Canadian design professionals," Lee said. "We have trained more than 10,000 people on how to use 3D design tools to invent and manufacture leading edge products." Join in Javelin's 2017 celebrations by following and using the hashtag #Javelin20. All of Javelin's nearly 100 employees will be choosing a personal 20-themed challenge and sharing their ideas and progress. Examples include making a donation to 20 charities, walking 20 minutes a day, and reading 20 business books. Javelin's sponsored athletes, Liz Gleadle and Pam LeJean, will participate with their own #Javelin20 challenge and encourage their followers to do the same. 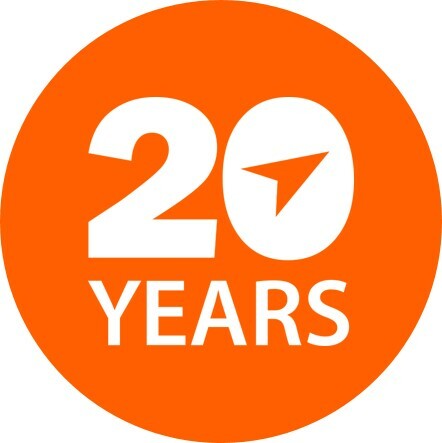 Javelin will also arrange visits to its first 20 customers and will welcome customers and friends to one of many 20th anniversary BBQ socials it will host in cities across Canada this summer. Check the Javelin website later this spring for details and registration. Javelin is online at www.javelin-tech.com and facebook.com/JavelinTech, and on Twitter and Instagram as @javelintech. Ted Lee (left) and John Carlan started Javelin Technologies in 1997 and continue to steer the ship as co-managing directors. 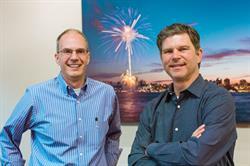 Javelin Technologies has grown from a handful of employees in 1997 to nearly 100 across Canada. 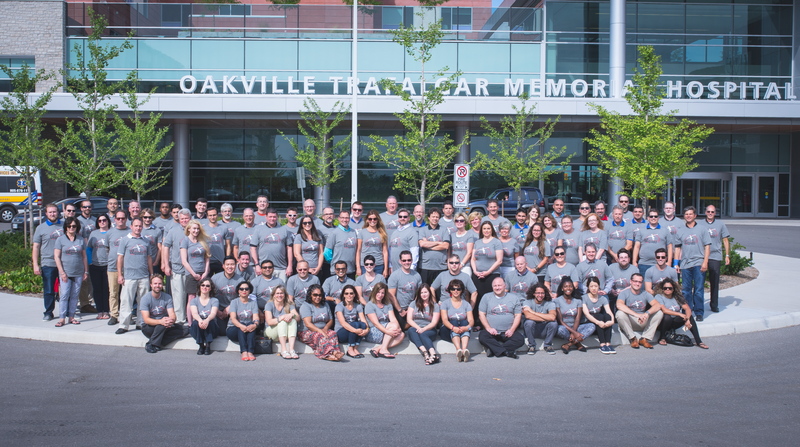 The team is pictured here in front of the new hospital in Oakville, Ontario, one of Javelin's community causes. 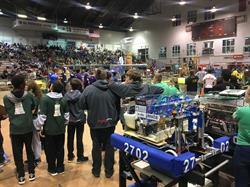 A Javelin-sponsored robotics team is turning heads at competitions for its use of 3D printing. 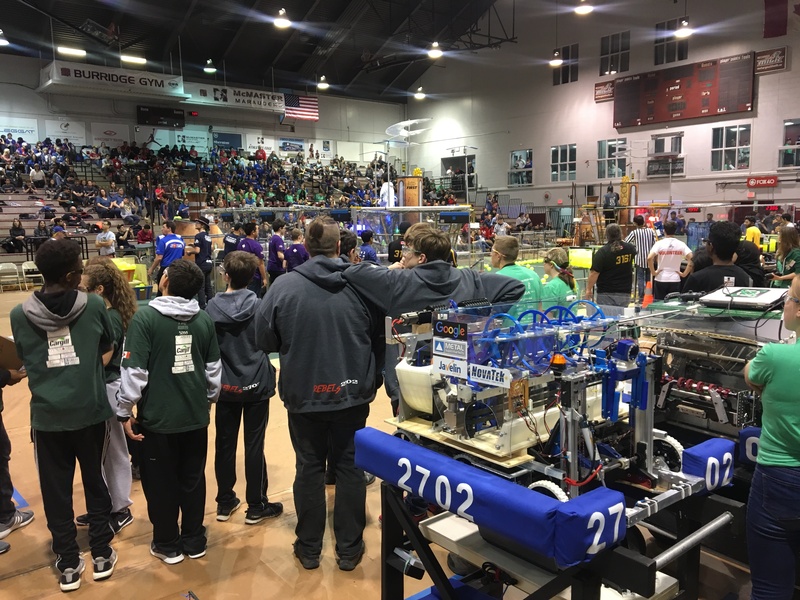 Javelin sponsors two schools with student robotics teams in Ontario - Eastwood Collegiate in Kitchener (Rebels 2702) and Oakville Trafalgar High School (1334 Red Devils and 1374 Amped Up). The Rebels are pictured here with their 3D-printed robot. Javelin Technologies celebrates 20 years in business in 2017. Hear from employees at Javelin Technologies about what it's like to work at Javelin.